I am reflecting this morning on the writing life. It is something I do on a regular basis. Being a writer is first and foremost writing. I’m compelled to do the often arduous process of stringing words together in some sort of coherent fashion. Without this action writing is merely theoretical. Why I, or anyone for that matter, write is an ongoing discussion. For me writing is akin to breathing. If I don’t write I don’t fully live. It is something I must do. Yet I struggle with the process. It is, after all, work, and one of my chief character defects is the aversion to labor. I’m not saying I’m lazy. More likely it is that work is hard. It is challenging and frequently difficult. The self-centered call to the comfort of doing things that are not so strenuous is strong in me. But without our labor we simply do not survive. And we miss out on a lot of beneficial growth. Gratefully, I still write. And I’m grateful to anyone who reads what I choose to share. Much of my writing may never be read. This writing is primarily in journals and it is cathartic and helps me to sort out my thoughts, ideas, values and beliefs. But a writer without readers is not whole. I realize that many people are not going to be writers. Lots of you enjoy reading and there is certainly nothing wrong with that and a great deal that is good about it. But we all have a story to tell. Finding a way to get that story told is the purpose of Your Life is Your Story and I’m constantly encouraging others to get that done in whatever fashion appeals to you the most. This Christmas as you spend time with family I hope you seriously consider how important our stories are and what sharing them can mean to those who don’t know those stories. Your story, and the life stories of your parents, grandparents, aunts, uncles, cousins, your own children, friends and even complete strangers, means something. It is part of the fabric of our world. We all have Christmas memories. As a youngster one of my first recollections of tinsel, lights and presents was in Florida. I’m an Air Force “brat” and Dad was stationed at Homestead AFB near Miami. I vaguely remember a combination of sun, warm weather and a Christmas tree. 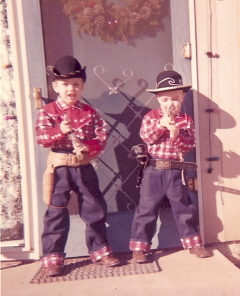 I’ve got a picture of me next to my younger brother, Doug from a Christmas past. We’re both decked out in cowboy garb. Kind of ironic as I don’t remember being a big country and western fan and as an adult I’ve spent many years working in rock radio formats. But it has all come full circle. I am currently employed at a country music station in Albuquerque, New Mexico. Christmas time is special for children and for grownups, too, when we’re able to let go of our adult obsessions and experience the magic of the season. The innocence of childhood allows us to see things through eyes of wonderment. Constant surprise is our companion. When I was very young I could never understand why my parents didn’t want to get up on Christmas morning as early as I and my siblings did. Sometimes my brother, sister and I would all be in one bedroom and we’d be wide awake in eager anticipation of what Santa had brought. My mom and dad thought 5 AM was way too early to begin opening presents and despite our protestations they would tell us to try and sleep some more, or at least give the consideration of a little more time before arising. I guess it didn’t occur to me they might have been up most of the night assembling train sets, bicycles and doll houses. Usually our whining would result in Mother bringing in our Christmas stockings and that would preoccupy us for a little while as we discovered the little puzzles and small toys in those homemade stockings. Often there would also be a bright penny, a pencil, an orange and a toothbrush snuggled inside. Mom was never one to miss an opportunity to pass on tips of nutrition, oral hygiene and an appreciation of small joys. Over the years as we grew up and our family spread around the country there were times when we’d be apart over the Holidays. And there were times when we’d be able to get together. I understand now what my parents meant when they told us all they really wanted for Christmas was for us all to be together. My family has an incredible number of birthdays in December and all close to Christmas. I was supposed to be born on Christmas Day, but I think my parents were both relieved when my birth happened on the 15th. Along with my birthday there is my older sister, born on Christmas Eve, my dad on Christmas Day and my mom the day after. With all those birthdays right at the same time we typically would celebrate Mom and Dad’s birthdays with a dinner, cake and presents on Christmas Day evening. My son is also part of the parade of birthdays at Christmastime. He was born on a snowy December 21st in Grand Rapids, Michigan fourteen years ago. 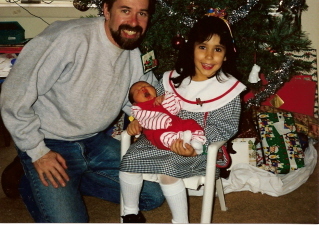 One of my favorite pictures that year was my five year old daughter holding her newborn baby brother on her lap in front of the Christmas tree. She said it was the best present that year. Christmas memories can run the gamut of emotions. Some are joyful celebrations, others lonely affairs. Some are more hectic with traveling and large gatherings. And some are just plain silly. But regardless of the circumstances or surroundings the gift of the Christmas Spirit can always be found. If we treasure those memories and record them to share with others on the Christmases yet to come we will discover that the Christmas past, present and future all exist together. I find it remarkable that the very first Christmas was a mother, father and a baby that brought tidings of great joy down through the centuries. With the end of this year you should consider how you might document the significant events in your family from 2007. Share them with your family and friends with a family newsletter. When you record a life story on video you get the to hear and see the memories of that person’s story. It takes some skill to put together a polished, professional and enjoyable video biography. Stellar Media, formed by Eric and Marian Larson, have successfully created many video life stories. I’ve interviewed Eric and will soon be featuring his business as a Highlight Site on Your Life is Your Story. I discovered from the interview that Eric has a great background in journalism along with a passion for creating quality DVD life stories for a good price. As Eric told me, "Everyone’s story is valuable – if well told and preserved I can’t imagine it being boring. Your future relatives would be fascinated to hear your story. People should value their stories more. Regret if don’t capture your family’s stories – video – with their expressions, body language, their voice and inflection – figures of speech." You can find out more at Stellar Media.